If there's anything you think should be added to this FAQ, or you see anything that should be changed, please post a reply to this thread detailing your suggestion. This thread will be cleared of replies regularly to keep the focus clear. If your post disappears, don't be alarmed: we got it. If your suggestion was not incorporated into the FAQ, don't keep posting. We decided, for whatever reason, that it was not right for inclusion. If you'd rather not post your suggestion publicly, feel free to PM me. Where can I learn how to make pixel art? What do I need to create pixel art? Why do people criticize my art? How do I hire a pixel artist for a project/job? Why should I register and be a Pixeljoint member? How do I level up? What does leveling up do? How do I change my rank theme? Can I change my Pixeljoint handle? How do I revise one of my gallery pieces? Why do some of the images in the gallery display as a red X? I found a gallery piece that violates the PixelJoint rules. What should I do? I found a gallery piece I'd like to use in my project. Can I? How can I support this fine site? When should I report a comment/gallery piece? How do I report a comment/gallery piece? Why isn't my submission showing up on the front page? I suspect a piece of art is a rip, but I can't put my finger on the original. What should I do? How can I search for pixel-art in the gallery? How do I submit my art to the site? Why is my submission still awaiting approval? Why was my submission sent back? Why wasn't my Lil'Dude or Wee accepted? Why was my pixel art sent back when other crap is allowed in? Can I submit pixels created by another as a showcase of sorts? I got an error when I tried to submit something! What does it mean? What counts as a valid preview image? Can I submit a pixel that I made with another member? Can I create a collab account? What is IRC and how do I connect to the PixelJoint channel? What file format should I use for pixel art? How do I know if my pixel is being saved as a png8 or png24? How do I make my GIF transparent? When I zoom images in the gallery, they get all blurry. Help! How can I see the specs of an image, such as color count, frames, etc.? Can I tell what position I came in if not 1st, 2nd, or 3rd? Can I edit my challenge entry whilst the voting is on? I have an existing piece that happens to fit in the current challenge. Can I submit it? Can I have multiple entries for a challenge? How can I verify that my challenge entry conforms to the restrictions? We have links to many helpful tutorials in our tutorials section, appropriately. The forum is also a great resource for learning from your peers. They often have relevant and useful information to help you along you pixel education. You only need two things: a graphics program and lot of patience. We can't help with the latter, but for the former see the links section or the forum resources section. PixelJoint is an art gallery and forum full of artists who are serious about about improving and helping their fellow artists improve. As such, users will often point out flaws in your art and hopefully give you advice on how to improve it. We refer to this as C&C, or comments and critique, and it's not just accepted but strongly encouraged. If you come from other art communities where the focus is not on improvement, you may find such comments hurtful or offensive, but please understand they are never meant as an insult, or to be taken personally. In fact, it should be taken as a great compliment that someone took the time to critically analyze your art and offer suggestions for improvement. That said, on very rare occasions users will be found to make rude and completely unacceptable posts that are only meant to stir up trouble. If you feel certain this is the case after reading the above, please DO NOT RESPOND! Report it and let the mods take care of them. The best way to find the perfect match is to contact the artist directly. If an artist is interested in work, they will usually have contact info on their profile. If you'd like to post a job offering you can do so in the job forum. You must read the job posting rules before posting an advertisement. If you still can't find what you are looking for try digging around the gallery and finding a pixel artist that suits you. Good luck! As you level up you'll gain the ability to give out more rating points for pixel art and more karma points* for rating other members comments. You'll also get new rank titles for the rank theme you've selected as you move up. Another benefit comes after you move up to Level 2 when you'll be able to vote in the Public Pixel Art Queue -- you'll have a say in what goes in the gallery. You go up in rank by accumulating points which you collect by contributing to Pixel Joint. Points can be collected by commenting on pixel art and news, posting pixel art, rating pixel art, posting links and posting news. Contests and having top notch pixel art will also get you special bonus points. Mostly just for fun, but we also want to help newer pieces get exposure in the hall of fame. As more and more people gain rank newer pixel art pieces will have a chance to "catch up" to the point total of older pieces because most people won't take the time to re-rank older pieces. This should help keep the top ranked art a nice mix of fresh work and old favorites. Plus, it's always nice to have more power (feel free to toss your head back and let out a hearty villain laugh). This information can also be found here, with a table describing what you need to do to get to each rank. Simply edit your profile and make a selection from the "Rank Theme" drop down list, then click "submit" at the bottom. Probably not. We almost never change handles because it causes havoc in the gallery and, more importantly, because people want to change their handles all the time and it keeps the staff from more important things, like pixelling ; ) Please choose your handle carefully when joining and write your password for later use as a backup. We only change handles in exceptional circumstances. If your request has been denied, please don't keep asking. Create a one yourself in pixelart or browse the Pixel Joint gallery until you find an icon you would to use for your avatar (64x64 is max size for avatars). Click on the icon to take you to the icon page. Click on the link and you've got yourself a new avatar! Note that the preview image is what is used as the avatar, not the full image. The site permits images as large as 100x100 to be used as previews, but they must be 64x64 or smaller to be used as avatars. Whenever you change, revisit or alter one of your pixels, you do not have to throw it away and then resubmit a new one. Just click 'edit details' on the pixel's page and make your changes. This way you keep all the comments, faves, and pixel score records intact. Also, sometimes members will be suspended or banned from the site and their gallery will be removed. When this happens, their old images should not be linked to anymore and you shouldn't get any errors, but things don't always work perfectly. If you think this might be the case, again, please report the piece. It's actually quite easy to make a suggestion. Simply fill out the contact form and write your ideas in the comments box. The contact form is the main point of contact for anything to do with the site so use it for suggestions, bug reports, complaints, praise, etc. Unless it's explictly stated in the description that the artist permits anyone to use their art without asking for permission, no. This is theft. All pixel art shown in PixelJoint is the property of the creator. Contact them directly for approval or any other arrangement. The goal of this site is to provide at outlet for the thriving pixel art community. Since this is a non-profit (or negative-profit depending on how you look at it) web site, the preferred way you can keep this little operation cooking is to link back to us or tell a friend about us. Banners can be found in our bannerssection. We also have a donate button on the front page and all money collected is used for competition prizes, server storage and software upgrades. Thanks for your support! Comments should be reported if they're deliberately offensive, insulting, cruel, obviously spam, or serve no purpose but to cause trouble. But do note that people are free to voice their opinions here, and we heartily encourage critique, so please don't report comments simply because you disagree with them or they're not entirely positive. Report any gallery piece that violates any of the gallery rules. To report a comment, just click the "Report" link right underneath and to the right of the the body text, and then click "OK" on the alert that pops up. To report a a gallery piece, click the relevant link under "Report Problem" on the rightmost column while viewing the piece in question and fill out the form it sends you too. You can choose from "Pixel art is ripped", "Piece is not pixel art", "Misc issue with pixel art", and "Issue with artist". When in doubt, use "Misc issue with pixel art". You should always file a report rather than confronting the artist directly. As a means of conserving bandwidth, no images over 10k in size are displayed on the front page, either in the New Works section or in the Weekly Showcase. This is usually only an issue with animations. You're advised to use a still if this is a problem for you. There's a handy site called TinEye that can do a search for images that are similar to an image you supply. If you find what might be the original source of a rip, please check it carefully to make sure that the original artist and the submitter of the PixelJoint piece aren't one and the same. Artists will sometimes sign up with different names on different sites. If you feel certain you've found a rip, please submit a report rather than confront the artist directly. There are two search engines: the PJ search engine (click search at the bottom of each page) and Google (use the search box at the top of each page). The PJ search engine works well with one keyword only, and returns images in the form of a gallery: most useful to find previous images of the subject you have in mind, let's say a dragon. You can refine your search using criteria such as dimensions, color number, isometric, etc. However if you want to search for pieces featuring a dragon and knight, and use those keywords, you'll only get pieces where those words appear in that specific order: little or nothing. Using Google is better in this case, although the results appear as a list without images. Upload your image to an image host, like ImageShack or TinyPic, copy the direct link they give you, and paste that link into the image tool window on the posting form. Step-by-step instructions for doing this are coming soon. When pixels are submitted, they first go to the public queue for your peers to vote on whether or not they should be allowed into the gallery. Until they accumulate enough "yes" votes, they are not added to the gallery. Some accumulate the needed number faster than others. Others have technical issues, questions or other details holding it back, such as links or unlisted credits or references. It's never personal. Sometimes we just approve it quickly (when it's clear the needed score will be gathered). If your piece doesn't gather enough votes and you'd like some feedback, posting it to the work in progress forum is strongly encouraged. If your pixel violates more than one of the below items or a reason not specified below, you'll get this one. Mods don't always have time to define the details, we like to pixel too. Use the WIP section of the forum to find your answers. NOTE: We really do try to be fair and only judge your pixels to your own pixels and progress. Don't ever think why is that allowed but not this. One member may very well have pixels allowed that on face value appear to be of lesser quality. If we feel that a member is improving and trying to learn and advance their skills these pieces will be allowed and further improvement encouraged. If another member's pixels just don't show any level of improvement over time, or worse refuse to take other members suggestions and words of wisdom then it may be sent back for quality standards. Not ours, the ones they set themselves. Obviously or probably made by someone else. You will need to prove it's yours on this one. These are all too often sent back after another member has reported the pixel. Be aware that we probably have the link to the piece and are being gentle with you. Any hostility and WE WILL post the link. This is very subjective and the toughest to clearly define. Most likely it just appears unfinished. We may feel that when comparing to your own gallery its not up to your best work or were being lazy. Think of this rejection as encouragement. Sexually explicit material is always sent back. PJ members are as young as 13 and Pixeljoint is family friendly. Your pixel background (BG) should serve a purpose. PJ members use many different themes and BGs can be distracting and even make the piece weak. There are some free programs available (look in FAQ, links, forum). www.iaza.com is there for your use too. Your lineart is well known, but you have failed to credit the original maker. This may also apply to obvious reference material. Your piece was determined by the staff to not be pixel art, or contain elements that are not pixel art. This includes oekaki and images that have been saved in an inappropriate format, such as jpg, or contain compression artifacts. The icon file for your pixel should match your pixel and entice PJ members to click on it to view the full pixel. Occasionally an icon is an extension of the pixel and may be allowed. Don't always count on it though. Clogging the gallery upsets the mods. If you have an awesome WIP stage image, don't submit it as a seperate pixel, add link in the description. If you made several pixels somewhat similar in nature, make a sheet and submit that instead. If you rework an old pixel, update the old with link to the old for comparison. You have broken a challenge or project rule or specification. You may not always get this explained any further as it gets boring to repeat over and over. You may also get this message if you submit a Wee or Lil' Dude, even though it conforms to the project rules. Please see the FAQ entry on that subject. The public queue (found on the main page) is where your fellow PJers vote on wether your pixel should be added to the gallery. If you get too many no votes then it goes back. Using the WIP section of the forum is a great place to find out members thoughts on your pixels. The Lil' Dudes and Wee! projects are no longer accepting submissions for the most part. Exceptions are made when a Lil' Dude or Wee! is of exceptional quality in originality and/or animation. Your Lil' Dude or Wee! is probably sent back because it is similar to another Lil' Dude or Wee! already part of the project. You have to wow PixelJoint for these projects. Why was my pixel art sent back when this other piece was allowed in? We do not ever compare one artist against another. It's neither fair nor useful. We are all individuals working at different levels. You are judged on your own gallery and skill level only. Over time some improvement should be shown too. Stagnation on your work may be a cause. Use the forum to discuss in detail. No. You are only allowed to submit your own pixels. The creator is invited to open a PJ account to submit their own works and are encouraged to do so. "All pixel art requires a valid small image"
This means that your "Detail File" is larger than 100x100 and you failed to include a "Small File", or preview image. All submissions need a small image file that can be used as a thumbnail for the gallery, displaying on the front page, and so on. If your Detail File is 100x100 or smaller, it is used for this purpose. 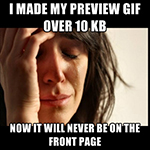 If it's larger, you need to create a separate thumbnail image and select in the Small File field. "Small image dimensions are too large! Small image max dimensions are 100 width by 100 height." Your "Small Image", or thumbnail, must be 100x100 pixels or smaller. No collab accounts, as mentioned. No multiple submissions.All artists involved must decide on a single one of them who will submit the piece. There must be unanimous agreement. All artists involved must give their consent and be properly attributed. This is supremely important. If even a single artist retracts his/her consent at any time, the piece will be immediately sent back for revision. If there's any doubt as to the consent of all parties when the piece is submitted, it will be sent back. Collaborators should be linked to. If they have a PixelJoint profile, link to it. If not, link to their profile on another site —wherever you think they're most active. No big community collabs with many participants. We're relying on squishy common sense for this rather than a firm number. Who did what should be explained in the description as clearly as possible. No collabs in weekly challenges! PixelJoint now has an RSS feed for the news section and chatterbox, but just what is RSS? Check out BBC's user friendly description of RSS and you'll see what RSS is and how useful it can be. You will need an irc program like XChat for Windows and Linux or X-Chat Aqua for Mac OS X. Firefox has an extension called Chatzilla that works very well too. Once you have this installed just hit the link for the IRC channel under the 'Community' menu above every page. IRC behavior rules are similar to those on the gallery and the forum. GIF or PNG. Most modern graphics programs can save in these formats. Many modern graphics editors support transparency natively, so you can just erase your solid background. Consult your program's documentation for specifics. If your graphics program does not, you can use an online service like Iaza to do it. First, make sure your image uses a unique color for the background —for example, if you use white for the background and also for the eyes, you'll need to change it or else you'll make the eyes transparent too. Go to iaza.com and load your image. In the main iaza menu, select Transparent—it's in the top-right corner, next to Transform. On the page it takes you to, click on any part of your image's background. Nothing obvious will happen. This is OK.
For Windows users, there's a free program called Giffy which you can use to easily make your images transparent. Download it here. Many browsers do this, unfortunately. There is no fix for most of them. Your best bet is to use Firefox and follow the directions in this post to see zoomed pixels in all their crisp glory. Note that this is fixed in recent versions of Firefox. Consider upgrading if this is still a problem for you. You can view most specs of an image here. To step through each frame of an animation, check out this great tool made by our very own 1ucas. No. The order in which green ribbons are displayed on the challenge winner announcements is completely random. No. Once voting begins your entry should be considered locked. No. All challenge entries must be made 100% within the challenge week. This also excludes edits of existing pieces. Yes! You can enter as many pieces as you can manage to make in time. Please note that you can enter your own challenge if a winner. You can use this link to check your challenge entries. Note that even if your entry passes all tests there, it's not a guarantee that it's acceptable for the challenge—there are some things that only a human can verify. There are two search engines: the PJ search engine (click search at the bottom of each page) and Google (use the search box at the top of each page). The PJ search engine works well with one keyword only, and returns images in the form of a gallery: most useful to find previous images of the subject you have in mind, let's say a dragon. You can refine your search using criteria such as dimensions, color number, isometric, etc. However if you want to search for pieces featuring a dragon and knight, and use those keywords, you'll only get pieces where those words appear in that specific order: little or nothing. Using Google is better in this case, although the results appear as a list without images. There is no valid reason why PJ gallery previews need to be under 10k anymore. Because early pixelart had so many restrictions and file size was chief among them its just something we like to keep. If your preview is over 10k it will not show on the Front Page Section with New Art, Weekly Showcase (WS) and Hall of Fame (HoF). It will however be seen everywhere else. You don't have to make your preview under 10k but you should.